We are Catholic and an inheritor of the Byzantine Church in Constantinople. Our inheritance as a Sui Juris (self governing) Church goes back to the year 988 when the Church, as found in Constantinople, was brought to Kiev at the direction of Saint Volodymyr the Great, Equal to the Apostles, Grand Prince of Kievan Rus’ (Present day Ukraine). 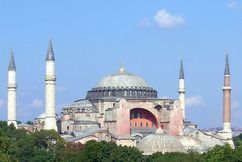 The Hagia Sophia in Constantinople (pictured right) was constructed by the Emperor Justinian during the fifth century. At the time, it was considered the largest church in all of Christendom. After the Baptism of Kievan Rus in the Dnipro River, many Churches were built in Kiev and throughout Scythia (the geographers' name for present-day Ukraine). 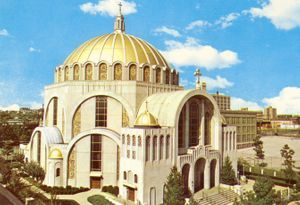 Among them were the Church of Tithes, (destroyed by Stalin in the 1930's) and Holy Wisdom Cathedral (St. Sophia), the Mother Church of the Ukrainian Nation. 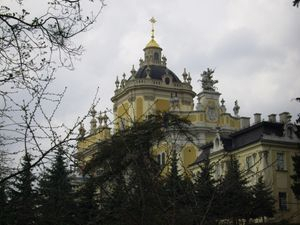 Holy Wisdom was built by the Grand Prince Yaroslav the Wise in 1036. Today, it is a museum and allows visitors to enter it and occasionally use it for religious services. 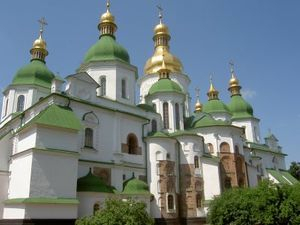 In its first seven centuries the Cathedral was used as a center of religious and national political life for the the Ukrainian Nation and holds the honor of having the first library ever in Ukraine. In the Eleventh Century, it became the first nation of Europe to be placed under the Protection of the Mother of God. St. George Cathedral in Lviv, Ukraine (pictured left) became the prinicipal See of the Ukrainian Greek Catholic Church in 1596 following the Union of Brest. At that time, we united with the Roman Catholic Church, which resulted in our Church becoming the largest Eastern Church in the Catholic Communion of Churches under the direction of the Pope of Rome and in union with him. 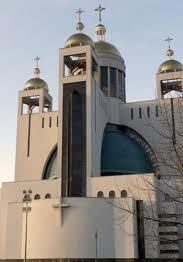 St. George Cathedral was the principal See of the Ukrainian Greek Catholic Church until 2011, when the See was moved to Kiev by His Beatitude, Patriarch Lubomyr (Husar) the Major Archbishop of Kiev-Galicia following the construction of the new Patriarchial Cathedral of the Resurrection in Kiev. Patriach Lubomyr was succeeded by the current Patriarch of the Ukrainian Greek Catholic Church, Patriarch Sviatoslav (Shevchuk) on March 25, 2011. We brought our Church with us when we emigrated to the United States and Canada late in the 1800’s. We have been on American soil for over 125 years. The Ukrainian Catholic Cathedral of the Immaculate Conception in Philadelphia (pictured right) is the principal church of our Metropolitan Province. Our first bishop was Bishop Soter Ortynsky who was headquartered in Philadelphia. Since that time, our See in Philadelphia was elevated to the status of a Metropolitan See headed by Archbishop – Metropolitan Stefan Soroka. It has 3 suffragen sees, Stamford, Connecticut; Chicago, Illinois: and, Parma, Ohio, which is near Cleveland. 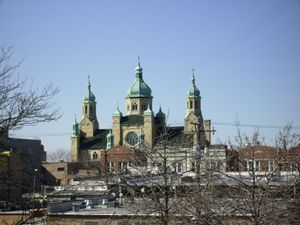 Holy Wisdom is a parish of the St. Nicholas Ukrainian Greek Catholic Eparchy (Diocese) of Chicago, Illinois. On July 14, 1961, Pope John XXIII signed the Papal Bull erecting the Eparchy of St. Nicholas in Chicago for Ukrainian Catholics. Its first Bishop, Most Reverend Jaroslav Gabro, was installed at the Cathedral of St. Nicholas in Chicago (pictured left) on December 12, 1961. The territory of the St. Nicholas Eparchy serves all Ukrainian Byzantine Catholics in the western United States and includes all of the USA and its territories west of the western borders of Ohio, Kentucky, Tennessee, and Mississippi. The eparchy has 46 parishes in 17 western states. In 2007, the Holy Synod of the worldwide Ukrainian Greek Catholic Church honored the centennial of Bishop Soter Ortynsky's arrival in Philadelphia by holding it's annual meeting in North America. This was the first time the Holy Synod met outside of continental Europe. It was a great day of celebration for us all. His Beatitude Lubomyr, our Patriarch at that time, convened the synod. The picture at the right shows the bishops and His Beatitude Lubomyr at the Hierarchical Liturgy that officially began the Holy Synod. The Divine Liturgy was celebrated at the Ukrainian Catholic Cathedral of the Immaculate Conception in Philadelphia. Our Church came to California in the 1950’s with immigrants who were exiles from World War II. Other parishes opened in Southern California during the same time frame. Holy Wisdom Parish was founded in 2002 as an English speaking and worshiping community of the Ukrainian Greek Catholic Tradition. We are dedicated to preserving our Tradition and inheritance by using English, a language that our children can understand. 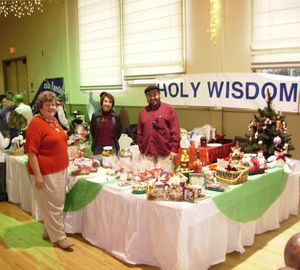 We participate in many local events with the Eastern Christian Churches, including the annual Christmas Around the World Festival (pictured left). We encourage and foster the Family in our church and in our lives. We are a parish that is multiethnic consisting of families from varying backgrounds including Native American, Spanish, Irish, German, Russian, Polish, Mexican, Italian, Ukrainian, English and a number people we don’t mention here, because we do not track people by ethnicity as each person is equal in every way to the next one. We are multiethnic and are open to all regardless of ethnicity. The mission of the Church worldwide is to worship God, to provide fellowship with God and each other, salvation, and eternal life when our life in this world ceases. We strongly believe in the example of Saints Cyril and Methodius, who in the 9th century, translated our Church books from Greek to Slavonic, the ancient language of our people. The Church then blossomed, and now it is blossoming again as we worship in, and pray all our services in English, the language of this land and our people. Children are the FUTURE of the Church and our own families. We welcome all people from the newborn to the octogenarian and beyond into our midst and to our parish. We welcome you too! Come visit us. We offer everyone fellowship, authenticity, and a two thousand year old church, that is as modern as today, rooted in Christ, the Apostles, America, and the Sacramento Region.